Time to play up your ponytail with one of fashion week's biggest hair trends. camera (Peter White/WireImage/Getty Images) A model walks the runway at the Oscar de la Renta fashion show during New York Fashion Week, Feb. 12, 2019, in New York. At Oscar De La Renta's fall 2019 show during New York Fashion Week, models such as Bella Hadid walked the runway wearing one of this year's biggest beauty crazes: barrettes! It's not all glitz and glam. There were pretty purples, sophisticated silhouettes, '70s glam and more. “The Rachel” to ponytails and beyond. Barrettes and clips adorned with jewels, rhinestones, and pearls were all spotted embellishing pulled-back shiny ponytails. While the look was front and center at one of Fashion Week's most anticipated shows, it's a trend that started to pick up speed with fashion-forward women everywhere late last year. Your locks will love you for it. Barrettes & snap clips for every mood & music genre. The barrettes we are seeing now aren't the big plastic colorful ones you might have worn as a child, but they are more grown-up and styled in a way to give your hairstyle an elevated wow factor. 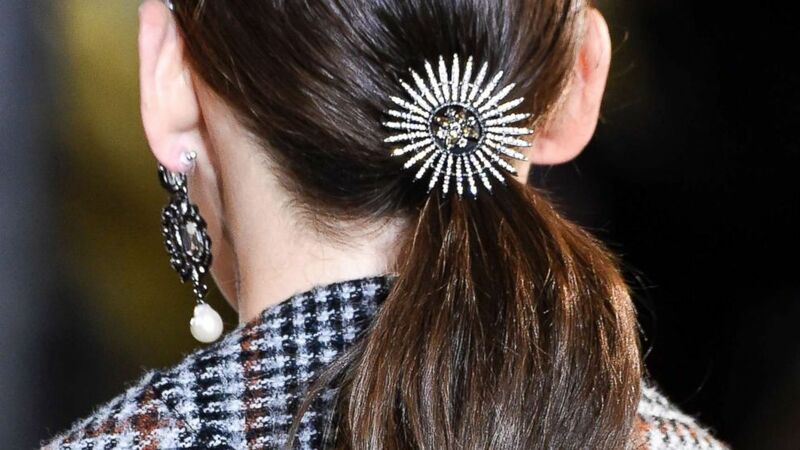 In case you aren't totally sold on the barrette trend, you might change your mind after seeing just how stylish the street style stars, fashion influencers, and everyday women just ahead are rocking their beautiful barrettes, cute hair clips, and precious jewels. Song dazzles in a "FEELINGS" hair clip from celebrity hairstylist Justine Marjan's accessories collection Kitsch. Verrelien is a dreamy vision with her fluffed out 'fro and lined up hair pins. Roiland played up her bangs and bob cut with a big, beautiful "GLAM" barrette. A hair flip is the perfect pose to show off this perfectly-placed clip Titheridge is rocking. Gerard went all out with a barrage of barrettes and jeweled clips to pull back her rose-toned sea of waves. As in “Damn, I will never make this much effort with my hair again” ??????? Caruso is pretty in pearls with this hair accessory pick from Pixie Market. Andrews is drippen' in gorgeous-ness just like her hair clip. What's better than one clip? Four! When I clip, you clip, we clip. It's hard to miss Simone's head turning barrette lineup. Tsegay is picture perfect with her pearl bag and barrettes to match.